For those that have been following this post before I go on to the second leg and original reason for this post, I will share with you my experience at the conference Museum communities and Reconciliation. I spoke on the second day of the conference after participating that morning with all the participants and donors in a open discussion. We had been handed the day before our assigned questions and I had the opening one concerning weather I thought that museums could act as truth commissions? I had practiced my talk that morning adding changes based on the previous days participants clarifying and giving a few more details. Then I panicked, “What was I doing there amongst all the participants that were dealing with life or death as they spoke out for truth in their communities and created memory space and museums for the disappeared in their communities. So I called Frank, my husband, almost in tears out of how humbled I felt. With his calm voice, my feet once more planted firmly even if a bit shaky on the ground grabbed all my stuff so that I could check out, met my friends and headed for the museum and the morning discussion. It was a fascinating open debate with numerous views. To summarize we most felt that museums were not truth commissions and should not take the place of but could act very responsibility to give truth and open the publics eyes to discuss and experience difficult and troubling concepts and issues surrounding specific events and that we hold a great deal of responsibility to collect information relating to these events making it available to the public and perhaps the very truth commissions that might arise. 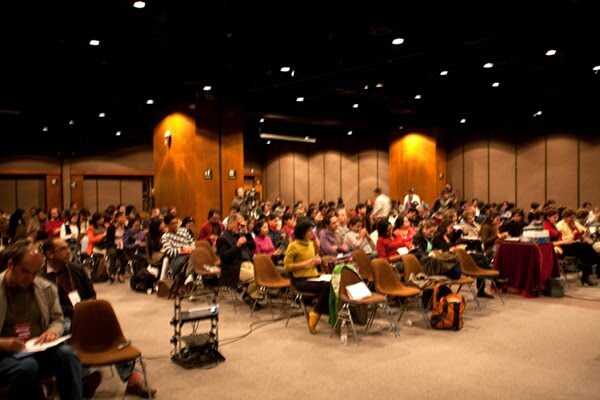 The afternoon talks took place in a larger hall in a library for a large Columbian Bank one of the sponsors with video conferencing to several other communities. After getting off to a late start realized that there would not be time for me to participate in the question and answer period and that I would respond later via email so that I could leave immediately to catch my flights to JFK/Dubai/Kabul. The participant before me was a very sweet Dominican nun who unfortunately like all of us had a large subject to cover in 35 minutes and went over her given time. My talk went well and as you can see from the two photos [one in this post and a second in the next post] to an audience of approximately 250 to 300. From the well wishing and thanks I received as I left the hall I felt blessed and sent on my way.